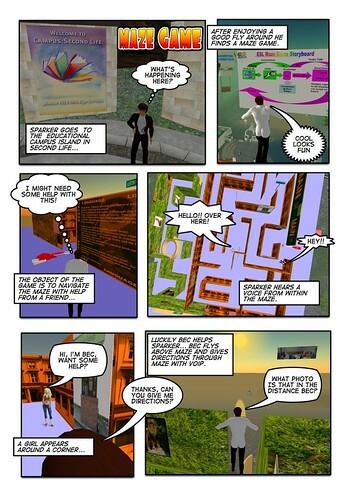 Last week I posted a process for developing educational resources through Second Life. We are still sorting out terminology but we agree with the general direction and so can proceed – thinking about better terminology as we go. The midwifery project seems to be going first and Sarah Stewart is the lead educator for the project. The first stage is focusing on the building of a virtual birthing unit, with information resources in it, and offline resources to compliment the build. Sarah has written up a view of where the users of this development will be at mentally before they engage with this project. Students are familiar with programs such as Word and Powerpoint. Their knowledge and use of the Internet varies considerably, and it is erroneous to make judgements about their use of the Internet according to age ie just becase they are young doesn’t mean they use the Internet for anything more than connecting with friends on sites like Facebook. The younger students all have Facebook or Bebo accounts, but they do not know about or how to use tools that can help their studying, such as Delicious or RSS. They would know about YouTube, but I don’t think they would think to use it for educational purposes. Use of Flickr is minimal and they have never heard of Slideshare, or recognise it as an educational resource. The last two groups of students have made their own class Facebook/Bebo accounts. I don’t know how they use it because they have not included lecturers in their group. Very few students would have heard of Second Life, and probably none of them are gamers. At this stage, Second Life is not a resource that is being used outside of the SLENZ project. I would say that motivation levels would not be high unless the students could see that there was something in it for them…the lecturers have mixed feelings about the Second Life project…they are stretched to capacity, especially with the development of the new program. They do not want to have to take on yet another project that is going to consume a lot of time, to both learn the skills to navigate Second Life and teach the students. So this sets the scene for what we are developing resources for in Second Life. My vision for the birth unit stage 1 is that it integrates into first year papers that look at birth from a philosophical point of view, looking at foundation knowledge and getting students to think about why things are the way they are in the birthing environment. I also see the birth unit giving us the opportunity to demonstrate to students what research evidence is, and how and why we base our midwifery decisions on certain research. This would integrate into the first year research stream. demonstrate effective evidence based, midwifery practice guided by a sound knowledge base. And so I wonder if it is the formal learning objectives that will determine that motivation. Hopefully there are more formal learning objectives we can refer to, or we need to devise an activity that has people considering the value of these extra and informal learning objectives that Sarah states (see below for one idea). Lead class discussion in class facebook group ? Treasure hunt questionnaire is integrated into research paper ie student must summarise research evidence they found? Go to the inworld birthing unit (SLURL/landmark) & meet instructor. Instructor will then give students instructions about how to work their way around the BU. Instructions on how to click on objects to go to external links provided eg note card? Ok great! All good ideas I think.. And Sarah goes on to list the types of SL objects that will be needed, which really helps the developers prepare. Make a short video documentary about the virtual birthing unit. To create an informative video that can be viewed on and offline, passed by email, and embedded in blogs and course management systems as a way to inform people about the project and motivate them to take a look for themselves. The video will include moving images of the building process and an audio track that includes: interviews with the researcher and architect who devised the birthing unit; the Second Life developers and their process of building it; and the lead educator and her thoughts on how the virtual unit would be used in someone’s course of study, and where the development will be heading. The video is made available on Youtube, Blip.tv, Internet Archive, Polytechnic websites and learning management systems. It is also on DVD, Data CD and USB Flashdrive. An audio only, and comic strip version-for-print is also available. Staff and students receive and watch the video, either through email notification, through a colleagues blog, on the LMS or from the CD. Those without such access receive the print and/or audio version. The video references orientation resources such as “how to start using Second Life” and “what sort of computer and Internet connection do I need”. A meeting date is set for people to arrive and meet at the virtual birthing unit for an official launch and orientation. Footage from this event is recorded and later added to the video afterwards. A finished build of the virtual birthing unit and the objects and information needed in it. Audio interviews with the birthing unit research and architecture team talking about their initial project and the thinking behind it; the SL developer team and how and why they decided to build the unit in SL, and the lead educators and what their ideas are for the educational uses of the SL unit. An edited 5 – 10 minute documentary combining the audio and the video into a “infomercial” for the virtual birthing unit. An audio track only version for slowband access. A comic strip print version for offline use. Links to existing “how-to” resources for access and using SL. A date for the virtual birthing unit launch. Compare and contrast the features in the virtual birthing unit with the features of an in-world hospital, or home birth location. Extend this to real world hospitals and home-birth locations. Edit the wikipedia entries for each of the objects in the birthing unit to a point where the text can be used in the build, or that the build informs the articles – such as the images from the build being used in the wikipedia articles. The next step, if Sarah agrees it is worth developing this resource and activity is to process the information here, into development specifications for the programmers and media producers. We are working on a document for that, and it is used by the developers to gather information from documents such as Sarah’s and mine here. # demonstrate an understanding of the role of the midwife in the normal childbirth process. I am loving the ideas of the video & comic strips-the more different sources of information, the better I feel. And also love the idea of it all being available for people to look at, at the launch. The other thing I am not too sure about is what you mean by writing about the objects in wikipedia. What Deb & I had thought was summarizing the research about nutrition, say, as represented by an item of food in SL, & linking to that. I think you can assume that our students/staff will not have blogs, not will they be very interested in doing anything in wikipedia/educator. So what I think we need to do is integrate their reflections/observations into the work they are doing on Moodle. So I like the idea of activites 1 & 2, but not 2. Sorry, I meant activities 1 & 3, but not 2. HI Sarah, thanks for reminder about all the learning objectives.. that solves my problem. Your activity sampled only a few of those which is fine. So I’ll refer to them in future activity designs. Water birth is a method of giving birth, which involves immersion in warm water. Proponents believe that this method is safe and provides many benefits for both mother and infant, including pain relief and a less traumatic birth experience for the baby. However, critics argue that the procedure introduces unnecessary risks to the infant such as infection and water inhalation. But I realise that people in the project may not want to do it that way. That’s OK.. everything in this project is Creative Commons Attribution, so I can just copy paste it for them later. As for students editing Wikipedia entries as an activity.. oh well. Can only try. I totally agree about the wiki idea, it’s just whether it’s wikipedia or another form of resource. I guess thats an argument you and I can have. What I can do is ask the lecturers of the second year normal birth course is how they feel about their students getting involved with this, because they do have an assignment that I feel would fit this activity. You and I are thinking on the same lines – I just hadn’t thought of wikipedia. The main problem with wikipedia is the perception of it not being ‘academic’ enough. But then again, what’s to say that a wiki I develop especially for this project is ‘academic’ enough. The other option I could look at is the MIDIRS wiki, which is a midwifery organisation who allows access to wiki – type media: http://www.midirs.org. Little wonder that we never have to look far to find someone exclaiming their frustration at academia and their lack of relevance to most things in life. But I’ll leave the question of convincing your colleagues to engage with the single biggest and most commonly used source of information on midwifery, childbirth and related topics.. to you 🙂 Could be that they are just too academic for it lol. Could be the Midwifery wiki is the most comfortable first step for them. Main thing is we efficiently and effectively get the content we need to attach to the objects in the Virtual Birthing Unit. This step could take a while couldn’t it Sarah? And its something that only you and the midwives can do. Might be good to start writing the info for each object up somewhere, ready for when the objects get built. Yes. Deb and I were saying that the other day. Before I start, I just want to check it out with everyone that they’re on board with the idea. Who will be making the comic strips? Dunno yet.. we need the video first. I know the project has a developer team, but they seem more focused on developing resources for in SecondLife.. but I think they have skills for outputting as well.. its pretty straight forward. And that post on comics that I link to.. it points to free software for generating the comic strip look if we want to go that style.